The Brunello wine district of Montalcino (Valdorcia) is two hour drive from Florence, consequently lovers of these wines are going to have to be patient with travel times. The total time of the tour is over nine hours. Furthermore, Brunello’s aren’t exactly cheap, and this reflects what I have to pay for tastings. For these reasons this tour has a higher price tag than my other offerings. 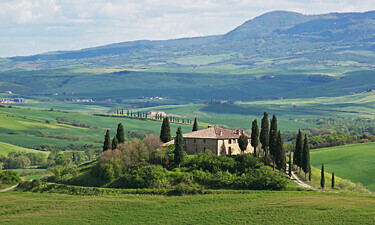 The day will have us enjoying a scenic drive of the Valdorcia along one of the most photographed roads of Tuscany. We’ll be visiting two family wineries and savoring a home cooked Tuscan lunch with paired tasting of Brunello at one of them. We close the day with a visit in free time to the delightful hamlet of Montalcino. 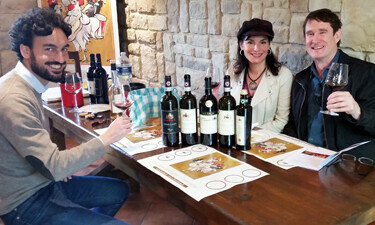 8.45am – Our Brunello Montalcino tour gets underway as we head down the highway for a two hour drive to Montalcino. It’s a long drive so we’ll of course make a pit stop along the way. Montalcino is a beautiful medieval town sitting on a hilltop and offering outstanding views. You’re free to wander in your own time to discover why the town is such a sought after location. Late morning we arrive at our first winery; a delightful family estate and everything you’d expect when thinking of Tuscany. We’ll start our visit with a guided tour of the cellars, then sit down to a delicious home cooked Tuscan lunch prepared by the owners. During lunch you will be served the estate’s Brunello & Rosso di Montalcino. 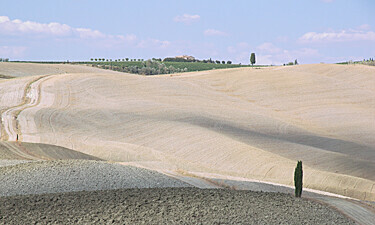 Brunello is only produced in this very small area of Tuscany, and is rightly considered one of the world’s top wines. We leave Montalcino and travel leisurely through the gorgeous Orcia Valley, where the landscapes have been carefully sculptured throughout the centuries. 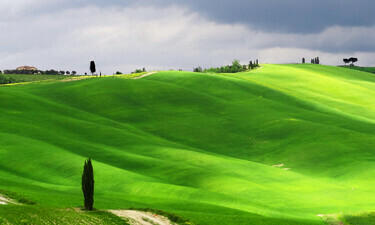 This not only to meet agricultural needs, but also to reflect the aesthetic sense for which Tuscany is famous. We’ll make a number of stops for your holiday photos at some of the famous postcard sites. You’ll have seen these pictures in books and calendars, but it’s even better to witness them first hand. Our second winery of the day will be one of the most prestigious of the region with many awards, where we’ll enjoy an over the counter tasting. To keep costs down, we won’t be visiting the cellars (however available on request & by appointment). We conclude our Brunello Montacino tour and have a two hour drive back return to our accommodation where we arrive around 06.00pm. Please note: Depending on the logistics of the day, we may not necessarily do things in the order described above. 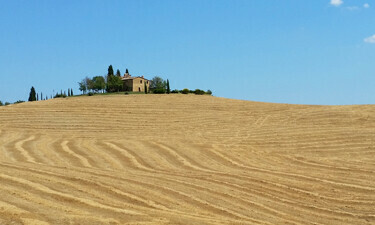 Also the countryside of Valdorcia has ever changing scenery depending on the farming cycles. Green from March to May, Golden in June to Mid July, then plowed fields the rest of the year. 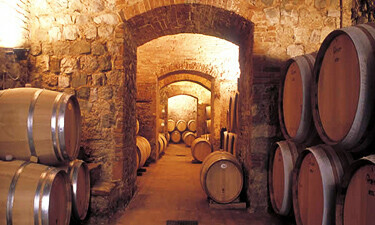 If you require something more economic check out my my tours to Chianti.